After directing two of the most extraordinary movies of the 1970s, Badlands and Days of Heaven, American artist Terrence Malick disappeared from the film world for twenty years, only to resurface in 1998 with this visionary adaptation of James Jones’s 1962 novel about the World War II battle for Guadalcanal. 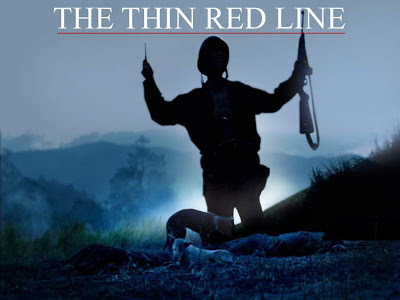 A big-budget, spectacularly mounted epic, The Thin Red Line is also one of the most deeply philosophical films ever released by a major Hollywood studio, a thought-provoking meditation on man, nature, and violence. Featuring a cast of contemporary cinema’s finest actors—Sean Penn (Dead Man Walking, Milk), Nick Nolte (The Prince of Tides, Affliction), Elias Koteas (Zodiac, The Curious Case of Benjamin Button), and Woody Harrelson (Natural Born Killers, The People vs. Larry Flynt) among them—The Thin Red Line is a kaleidoscopic evocation of the experience of combat that ranks as one of cinema’s greatest war films. An excellent movie to understand the psychology of young men thrown into combat. Acting is very good and often superb. Location is well chosen (could not be done in Guadalcanal itself though) and special effects are well done. The most interesting aspect is the various dialogues about the cynicism and unfairness of war in this world, "there only world there is". This is true of most wars of course, nothing specific about Guadalcanal. There is a scene at the beginning of the movie that suggests otherwise: a couple of soldiers are stranded on an idyllic island with happy indigenous villagers. In fact it's too bad there is precious little in the movie that tells you much about the Guadalcanal battle itself. Only scant reference is made to the historical context and the significance of this island in the early months of WW II. I would have liked additional historical facts to be relayed through the dialogues and battle scenes. Extras: deleted scenes add value, especially one with GIs moving Japanese prisoners. PS: don't hold your brerath to see much of George Clooney, he only gets a couple of minutes at the very end.